In Christianity, every biblical truth has a corresponding distortion. For example, the apostle Paul writes, “where sin increased, grace increased all the more” (Romans 5:20). He immediately went on to deny, however, that believers should “go on sinning so that grace may increase” (6:1) in light of this truth. Antinomianism, in other words, is a distortion of grace, not its logical consequence. Sorting out distortions of doctrine from their logical consequences is a matter of vital importance for the contemporary Pentecostal and charismatic movements. Those movements teach the biblical truth that the gifts of the Holy Spirit outlined in Acts 2, 1 Corinthians 12–14, and Ephesians 4, among other New Testament passages, did not cease to operate in the first century but continue to operate in the lives of believers today. That truth is capable of being distorted in many ways, for example new revelations that contradict Scripture, an overemphasis on the miraculous to the exclusion of the ordinary, and a use of gifts that inflates the pride of the gifted rather than enriching the lives of those to whom the gifts should be given. Just as Paul corrected the Corinthians’ distorted practice of spiritual gifts then, so Pentecostals and charismatics need to correct distortions of biblical truth that have traction in their movements now. What is the New Apostolic Reformation, then, and why should it be critiqued? One way of countering NAR doctrine, on these and other points, is cessationism, which denies that the miraculous gifts of the Holy Spirit continue to operate today. This is the approach taken, for example, by John MacArthur in his book, Stranger Fire. This approach will not work for Pentecostals and charismatics who refuse to discard the kernel of the contemporary work of the Holy Spirit along with the chaff of NAR teaching. Cessationism is also not the approach Geivett and Pivec take. Rather, they argue that “apostles” and “prophets” are spiritual gifts in the New Testament, not church offices such as “overseers,” “elders,” and “deacons.” They further distinguish “apostles of Christ” (e.g., the Twelve and Paul) and “apostles of the churches” (e.g., Barnabas, James, Andronicus and Junia, Jesus’ half-brothers, and Silas). While the latter are the modern-day equivalent of missionaries and church planters, the former are unique to the first century, having been commissioned personally by Jesus Christ to authoritatively proclaim and (in some cases) inscripturate the gospel. Regarding prophecy, Geivett and Pivec further argue that the authority NAR doctrine gives to prophets over the lives of individuals and churches is unbiblical and potentially dangerous. Finally, regarding (5), “Many in NAR believe they will work miracles, like prophesying and healing the sick. They also believe they will be part of an army that will work greater miracles than the original apostles and prophets and even Jesus. This army is called by various names, including the Manifest Sons of God and Joel’s Army.” Again, the biblical problem with such a position is straightforward. The Bible does not teach that every Christian is given every spiritual gift. As a classical Pentecostal, I’d nitpick this a bit by noting that Acts seems to teach that tongues is the initial physical sign of Spirit baptism, but otherwise, I’d agree with Geivett and Pivec’s point based on 1 Corinthians 12:27–31. Obviously, if someone claims that the Bible teaches X, but the Bible does not, in fact, teach X, that claim should be critiqued and declared false. I think that is the case with NAR’s distinctive doctrines. But it needs to be remembered that the vast majority of NAR leaders and followers are fellow Christians. Indeed, as Geivett and Pivec write in A New Apostolic Reformation?, “We assume that the leading NAR figures are believers and genuine disciples of Jesus, and that their intention is to do the will of God in their lives and in the world.” They believe in the inspiration and authority of Scripture, the Trinity (with a few Oneness exceptions), the Incarnation, and the Atonement. Like classical Pentecostals and charismatics, they believe that the miraculous gifts of the Holy Spirit continue to operate today. 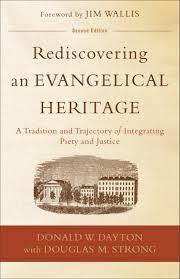 NAR distinctive doctrines are not traditional evangelical doctrines, let alone classical Pentecostal doctrines. 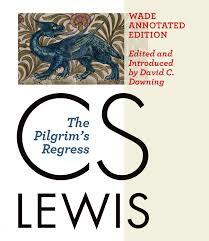 It is in error, from those viewpoints, but not all errors rise to the level of heresy. So why bother critiquing them? In other words, NAR doctrine should be critiqued because it breeds dependency, results in distraction and diminished spiritual growth, invites disillusionment, and fosters division. Every biblical truth has a corresponding distortion. 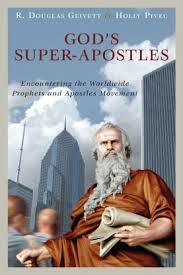 As a classical Pentecostal, I see brothers and sisters among leaders and followers of the New Apostolic Reformation. Chances are, you, your family, or your church has heard of NAR’s doctrines or have been influenced by them. With R. Douglas Geivett and Holly Pivec, however, I believe that NAR doctrines are not true because not biblical and unhelpful because untrue. The Psalter is the prayerbook of Israel and the Church. Unfortunately, many American evangelicals do not make regular use of it in their personal and corporate worship. Some years ago, I began using it for morning and evening prayer, and I have found my faith in God enriched through the practice. A few months ago, I discovered that Crossway had published The Psalms, using its English Standard Version. The ESV is a good translation, though it is not the translation I use most regularly. Nonetheless, I was impressed with the beauty and utility of The Psalms and decided to use it for personal worship. What makes The Psalms helpful? First, it presents the psalms in a single column, removes explanatory subheads and notes, and moves the chapter and verse numbers to the side so that they do not intrude on the reader’s vision. This has the effect of emphasizing the poetic structure of the individual psalms and concentrating the reader’s attention on their words. The Psalms is a beautiful presentation of the Psalter’s beautiful prayers. 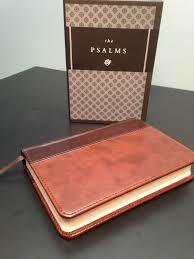 Second, The Psalms is well constructed, with a leather-like cover over hard board. (A top-grain leather edition is also available, as well as a standard hardcover edition.) Its pages are thick–unlike the onion paper of most Bibles–and hence durable for daily use. Finally, it fits easily into the hand, large enough to accommodate pages with a good-size font (11 point, in fact), but not so large that it is unwieldy. This is a prayer book-sized Psalter, easy to hold and small enough to fit into a suit pocket or purse. Finally, though the ESV is not my preferred translation, as noted above, I find its translation of the psalms very helpful. The word-for-word (or formally equivalent translation) retains much of the language of the King James Version (and its English successor translations) without being antiquarian. Obviously, if you don’t use the Psalter daily, there is no special need to purchase The Psalms in any translation–let alone the ESV–when you can simply read them in your Bible. On the other hand, if you do use the Psalter as a daily prayer book, The Psalms is an option that you should look into. George Whitefield is not well known by Americans today, including American evangelical Christians, his spiritual heirs. In the eighteenth century, however, Whitefield was well known not only in America, but also in his native England—well known, well loved, and widely criticized. Thomas S. Kidd outlines the life of this influential evangelist in George Whitefield: America’s Spiritual Founding Father. 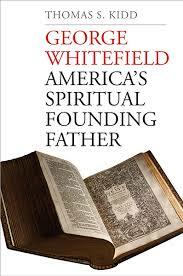 Whitefield was born in a Gloucester inn on December 16, 1714, to hardworking though not particularly religious parents. He secured a work-scholarship to Oxford University, where he fell under the spiritual influence of John and Charles Wesley and entered ministry in the Church of England. Together with the Wesley brothers, Whitefield led the trans-Atlantic evangelical revival that came to be known as the Great Awakening through ceaseless itinerant evangelism, innovative use of print media, and development of personal and institutional relationships across denominations. Reading Kidd’s biography of Whitefield—which will be the standard work for years to come—I was struck by several similarities with contemporary American evangelicalism that are worth noting, both positive and negative. The first is Whitefield’s blend of principle and pragmatism. Whitefield was an ordained priest in the Church of England and a convinced Calvinist. This did not prevent him from working with English Dissenters and Arminians (at least of the Wesleyan variety), Scottish Presbyterians, or American Congregationalists, however. Rather, with them, he emphasized the experience of the “new birth”—that is, being born again—and the doctrine of justification by faith. These expressed the essence of the gospel. To proclaim that gospel, Whitefield pragmatically utilized a variety of innovative techniques. These included itinerant evangelism, field preaching, personal discipleship (the hallmark of Methodism), and the use of newspapers to promote the ministry. The result was a trans-Atlantic revival united by a powerful spiritual encounter and a theology that explained it, far more than by ecclesiology or denominational distinctives. The second is Whitefield’s emphasis on the ministry of the Holy Spirit, both as the One who brings about regeneration (the technical term for the new birth) and the One who empowers ministers to proclaim the gospel. Wesley’s journals are filled with descriptions of people experiencing the throes of spiritual conviction, not to mention the experience of breaking through to the peace of conversion. He also routinely speaks of the Spirit prompting his actions and words. Kidd even notes a handful of occasions where Whitefield, his colleagues, or his followers may have spoken in tongues. Ironically, in light of the cessationist theology that characterized evangelical Calvinism in the early twentieth century, Kidd points out that the revivalists believed in the contemporary work of the Holy Spirit—though not as Pentecostals do today—while their non-evangelical critics were the ones who were cessationists, believing that the gifts of the Holy Spirit had ceased in the Apostolic Era. The third is the paradoxical combination of unity and division. As noted above, the Anglican Whitefield partnered with ministers of other Protestant denominations to promote revival. This is true of evangelicalism to the present day. But just as there are sharp theological disputes today between Calvinist and Arminian evangelicals, there were sharp theological disputes between the same two groups in the eighteenth century. Whitefield was a staunch Calvinist, as was the Welsh evangelist Howell Harris. The Wesley brothers, on the other hand, were equally staunch Arminians. The theological debates between those four individuals, and their respective followers, were intense and often nasty. Nevertheless, throughout his ministry, Whitefield found his way toward cooperation with the Wesley’s in gospel ministry. The fourth is the confusion of the gospel and patriotism. Whitefield came to prominence during Protestant England’s seemingly endless wars with Catholic powers. Like other Protestants in his age, he viewed the Reformation dispute with Rome as both theological (How are we saved?) and political (Who will rule us?) in nature. During the War of Jenkins’ Ear with Spain and the Seven Years War with France, Whitefield preached pro-English, anti-Spanish, anti-French, and anti-Catholic sermons that are embarrassing to read today. My guess is that in two hundred years, the patriotic sermons of today’s evangelicals will cause readers to blush too. On the other hand, the past is not so foreign that it is unable to teach us lessons about our own time. This is especially true of contemporary American evangelicalism. The trans-Atlantic evangelical revival of the eighteenth century initiated patterns of spiritual experience, theological doctrine, and ministry methodology that are still recognizable among American and British evangelicals today, for better and for worse. As evangelicals move forward in the twenty-first century, it is thus reasonable to ask: Who will be our Edwards, to teach us in this postmodern intellectual milieu? Who will be our Wesley, to organize, network, and disciple us? And who will be our Whitefield—the evangelist whose preaching of the gospel will draw men and women, boys and girls to Christ? Kidd notes that Whitefield was perhaps “the greatest evangelical preacher the world has ever seen.” I would add only five words: though hopefully not the last. Marriage is delightful. It is also difficult, however. While the divorce rate may not be the oft-quoted 50 percent, it is still significant. The relevant question, then, for Christians getting married or already wed is this: What can a couple do to make sure their marriage thrives? 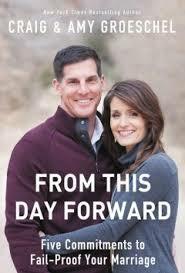 Craig and Amy Groeschel offer an answer to this question in their new book, From This Day Forward. Craig is the founding senior pastor of LifeChurch.tv, an innovative multisite church best known for its Bible app, YouVersion. Amy leads LifeChurch.tv’s women’s ministry and homeschools the Groeschel children. Craig wrote most of the book, but Amy adds her unique “angle” at the end of each chapter. Can marital wellbeing really be that simple? Based on my nearly 10 years of marriage, I would say both yes and no. Or better, I would say that marital wellbeing is easy to analyze but difficult to practice. A couple which strove to put these five practices to work in their marriage would significantly improve both the quality and durability of their union. From This Day Forward is written in an easy, conversational tone that makes for a quick read. It doesn’t—thankfully!—get bogged down in exegetically driven discussions of gender roles (i.e., male headship, female submission), though it occasionally it reflects gender stereotypes (e.g., men prefer physical intimacy, women prefer emotional intimacy). I would have liked to see more discussion of topics such as finance, childrearing, and traumatic stressors (e.g., illness or death in the family), though the Groeschel’s five practices probably cover those concerns, at least in principle. Who, then, should read this book? Those about to get married, for sure, and those already married (especially if they’re in their early years together). Zondervan has produced a DVD-based small group curriculum based on the book, making the book and/or the curriculum ideal for use in a church’s engaged couples seminar, small groups, or Sunday school classes. Unfortunately, the Groeschels cite the 50 percent figure throughout the book. For a thorough debunking of and other marriage myths, see Shuanti Feldhahn and Tally Whitehead, The Good News About Marriage: Debunking Discouraging Myths about Marriage and Divorce (Colorado Springs, CO: Multnomah Books, 2014). Rediscovering an Evangelical Heritage is an important book, nearly forty years after its first publication, because it delivers on the title. Evangelicals with left-leaning politics will find in its pages a “usable history” to underwrite their efforts. Though my political predilections lean rightward, I still found Dayton’s argument an engrossing read. Part of this is because my own tradition of Pentecostalism itself is a late outgrowth of mid-nineteenth-century evangelicalism. (See Dayton’s Theological Roots of Pentecostalism, for example.) I share the earlier evangelicalism’s egalitarian tendencies, for example, as well as its revivalism and Arminian theology. But another part is my empathy with its social location. Nineteenth-century evangelicals stood outside of social systems they deemed immoral and unjust and worked to reform them. I feel similarly today about my own social location.